I suspect that some people thought that given the supposed paucity of films about women on the big screen, it would be to Werner Herzog's credit to show that he had at least tried. But this was a grave miscalculation. I try never to play "what if" because you can't ever know what would have happened if only it had... In this case, I can't help wondering what would have happened if only Herzog had hired a woman to write the screenplay (or at least collaborate with him on his screenplay)... But since I didn't think much of The Iron Lady (the Margaret Thatcher BioPic directed by one woman and written by another) and I thought even less of The Lady (the Aung San Suu Kyi BioPic directed by a man but written by a woman), I am painfully aware that it's just not so simple. Both men AND women have conflicted feelings about powerful women, and even if those reactions are fundamentally different, that still doesn't guarantee that women filmmakers are any more successful at capturing the essence of female sheroes. We have only to look at the 2016 U.S. Presidential election to see how hard women can be on other women when they want to be. Unfortunately, current tropes seem to dictate that women in the audience like love triangles (even when we all knew in the Twilight series, for example, that Bella Swan was always in love with Edward Cullen whereas Jacob Black was never more to her than just a very good friend). 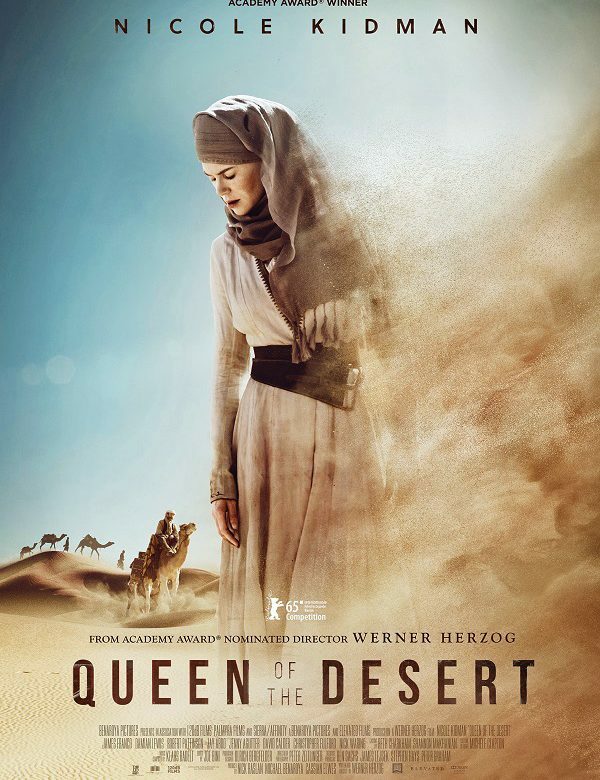 So Queen of the Desert gives us two love triangles: first "Gertrude Bell" (Nicole Kidman) must compete against her cousin "Florence Lascelles" (Holly Earl) for the attentions of "Henry Cadogan" (James Franco), then Gertrude must compete against "Judith Doughtie-Wylie" (Sophie Linfield) for the attentions of her husband "Charles Doughty-Wylie" (Damian Lewis). Don't get me wrong. Both men are actual historical figures and Gertrude had romantic relationships with both of them... But I sincerely doubt that the "triangle" aspects were of much concern to her. But ironically one of the most important relationships in Gertrude Bell's life, and without doubt the most historically significant relationship of her life, was her relationship with T.E. 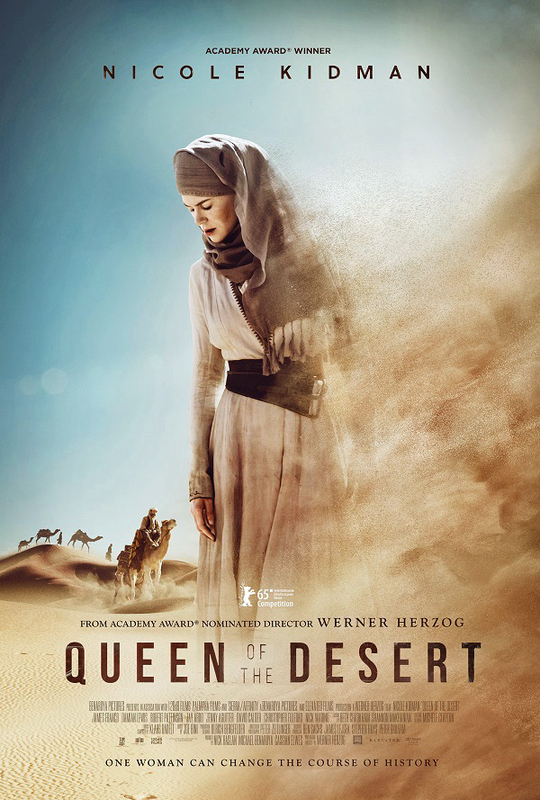 Lawrence (aka "Lawrence of Arabia"), and for some reason Herzog decided to completely distort this relationship, making it not only secondary to all the bodice-ripping romance of the other two, but also completely and thoroughly ahistoical. Why, Werner? Why? Trust me, I know what I am talking about, because one of the ironies of my own life is that my all-time favorite film is Lawrence of Arabia, a film in which there are no female characters and no Jewish characters either, therefore not just irrelevant for my "Pink Blog" (aka The Hot Pink Pen) but also for my "Blue Blog" (aka Second City Tzivi) as well. And so, when the first scene (which opens with Charles Doughty-Wylie and T.E. Lawrence (Robert Pattinson) meeting with Winston Churchill to carve up the map of Arabia) is labeled "Cairo - 1914," I started groaning... And it all went downhill from there... For the record, I went back in afterwards to watch the beginning a second time just to make sure my memory hadn't deceived me... Nope... Cairo - 1914... Oy! Luckily, I recently saw a wonderful new documentary called Letters from Bagdad which will be released in NYC theatres in June, so I will have a great deal more to say about Gertrude Bell very soon. Meanwhile, avoid Queen of the Desert like the plague because it stinks! The only person in the cast or on the crew who can still hold a head up after the credits roll is cinematographer Peter Zeitlinger. So kudos to him, but otherwise? Feh!